The Oklahoma Department of Health recorded more than 74 flu-related deaths in the 2017 flu season and more than 2,000 hospitalizations in this state. Of those hospitalizations, 276 have been within the age group of 18-49. Tulsa, Cherokee and Muskogee counties have reported 559 hospitalizations. Tulsa County, who has recorded 15 deaths this season, recorded more deaths than any other county. According to the OSDH, there are two main types of flu that affect humans, types A and B. Either type can make its round in the United States each year during the fall and winter months. Each type of flu virus has different strains, which change from year to year due to mutations. Matt Lee, pharmacist at Tahlequah Drug Co., said the most important thing to do is to seek treatment as soon as symptoms arise. Symptoms of the flu may include fever of 100°F to 103°F, cough, sore throat, runny or stuffy nose, muscle or body aches, headaches and extreme tiredness. Nausea, vomiting, and diarrhea are less common symptoms that can accompany the flu. The Center of Disease Control and Prevention states the flu vaccine proved to be only about 30 percent effective last season. It is never too late in the flu season to be vaccinated. Vaccinations can take two weeks to become effective, and it is recommended to get the flu shot as soon as it becomes available. Students are at a greater risk of coming into contact with contaminated surfaces on campuses and all who are diagnosed or experience symptoms need to wear a surgical mask, wash hands, and use hand sanitizer to lower the risk of spreading the flu. 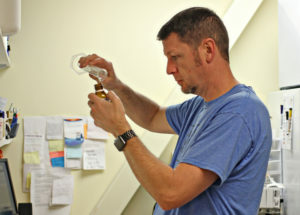 Pictured above is Pharmacist Matthew R. Lee preparing Tamiflu during the busy flu season.